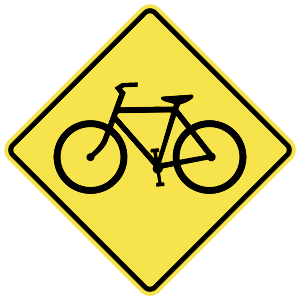 What should you do when you see this sign? Look for a train station ahead. Signal before going any further. 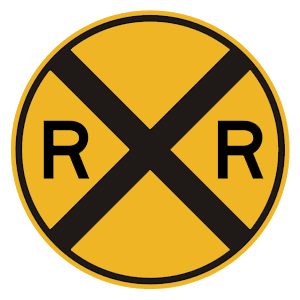 Slow down and yield to trains. Stop at the crosswalk until a crossing guards signals for you to go. 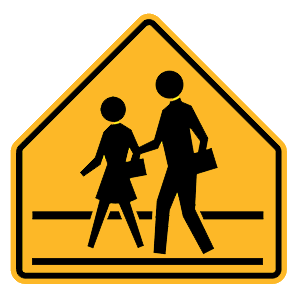 A five-sided sign indicates that you are near a school. Be aware and stop if children are in the crosswalk. Are following a small passenger vehicle. Are being tailgated by another driver. Are driving more slowly than the posted speed limit. When being tailgated, create extra space in front of your vehicle and do not brake suddenly. Slow down gradually or merge into another lane to prevent a collision with the tailgater. To avoid making any sudden stops or turns, drivers should be aware of what's ahead of their vehicles. It is a good idea to watch the road and your surroundings at least one city block ahead of your vehicle. If the shoulder is wide enough. Passing on the right is permissible only if it is possible to do so without driving off the roadway. Never pass another vehicle on the shoulder because the other driver will not expect you to be there and may pull off the road.